Down Payments And Closing Costs: How Much Do You Need With FHA? One of the reason FHA home loans are so popular is due to their low down payments prerequisites. 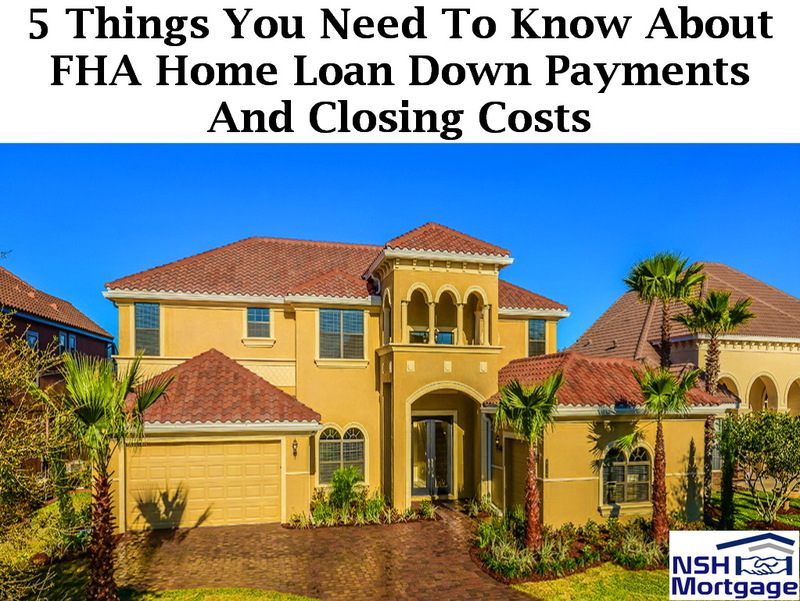 In this article we are going to talk about the 5 important things you will want to know about FHA down payments & closing costs. NSH Mortgage has the wisdom and tools to help you with finding how this affects you. While your credit score exceeds 579, you will be eligible for a 96.5 percent financing, even with a 3.5 percent down payment. So, how much will your down payments and closing costs be? This post will help you determine that amount, and help you minimize it. If your credit score is 580 or higher, your minimum down payments for FHA financing is 3.5 percent. If your FICO is between 500 and 579, you are eligible for financing with ten percent down. Keep in mind that being eligible for financing is not the same as being approved for financing. You can also apply, yet very few people with the minimum scores get approved for FHA home loans. So if your credit score is marginal, consider coming in with a higher than required down payment. So find out if you have either an low credit score or an bad credit score to weigh out your current options. With FHA homes loans, you can get your entire down payment as a gift from friends or family. Your employer, church or other approved organization may also gift you down payment funds. Gift funds must come with no expectation of repayment. Get a signed gift letter from the giver, showing the amount of the gift, and that it is a gift with no expectation of repayment. Document the transfer of funds into your account, for a deposit receipt or account statement can be considered as good. The reasons for all these documentation. Is to make sure that the gift doesn’t come from the seller, real estate agent, or anyone else who would benefit from your home purchase. Can you borrow your down payment for FHA loan? You can only borrow funds from approved sources, and these mainly comprise down payment assistance programs through various charities and agencies. However, these programs are still worth checking. While many provide low to no interest loans for your down payment and closing costs, which will be up to five percent of your purchase price. One way to finesse the borrowed down payment question is to season borrowed funds. The idea is that when you borrow money and put in into your account, it is pretty hard to tell which money in there was already yours, and which are the borrowed funds. After a couple of months, it is all mixed up. If you took out a personal loan a couple of months ago, and put the money into your checking account, you would disclose the loan on your application under debts. And the money is just your money, sitting in your checking account. Note that the two monthly statements you provide with your loan application should be from the time after the deposit of the borrowed funds. Large deposits on a bank statement always trigger extra inquiries from underwriters. As noted above, you cannot get a down payment gift or loan from the home seller, or anyone else who might benefit from the transaction. However, you can get help with your closing costs from a motivated seller. FHA loans allow sellers to cover closing costs up to six percent of your purchase price. That can mean lender fees, property taxes, homeowners insurance, escrow fees, and title insurance. Naturally, this kind of help from sellers is not really free. If you want six percent of the sales price in concessions, you will have to pay six percent more than the price the buyer is willing to accept. That is okay, since the property will appraise at the higher price. FHA requires an upfront mortgage insurance premium (MIP) of 1.75 percent of your loan amount. However, most borrowers combine that charge into their loan amount. The rates with negative numbers have what is called rebate pricing. That is money that can be rebated to the borrower and used for things like closing costs. So if you have a $100,000 loan with a three percent rebate, you get $3,000 from the lender to cover your closing costs. How can lenders do this? They do it by offering you a higher interest rate in exchange for an upfront payment now. So, you would get 3.75 percent if you paid the normal closing costs, while 4.125 percent would get you a three percent rebate. If you only keep your loan for a few years, you can come out ahead with rebate pricing.